I have been hibernating in my den for the past few month. I am finally waking up and joining the world of blogging again. My injury plus the surgery took some time to recover. I thank everyone who had been so gracious to leave get-well comments on my post. Thank you very much. 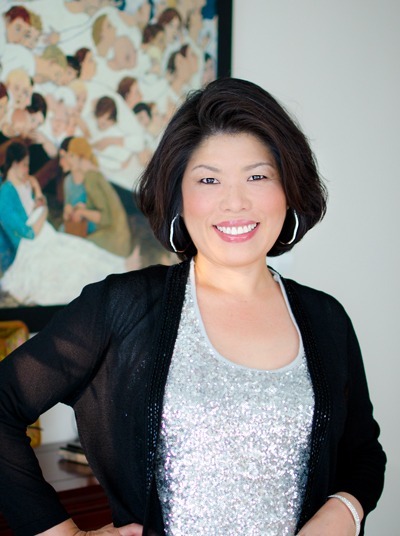 I am still not 100% well yet but I feel good enough to get back to the kitchen and cook some delicious meals for my family and myself, and share the recipes with my readers. Before I start today’s recipe post, I would like to share a wonderful meat that I came across. “The Bos Life” of artisan meat contacted me for trying their product. Their artisan meat is raised free of hormones and antibiotics. Their beef is harvested from grassfed cattle in the traditional way. Unlike some grassfed cattle beef I have tried before, which often yields dry and tough texture, the beef from Bos Life was impressively tender and flavorful with distinctive marbling and a clean taste. 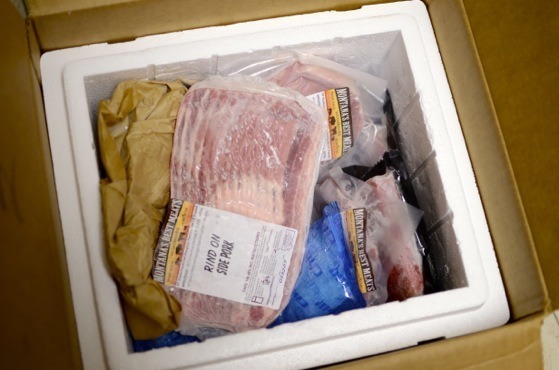 The meat box was delivered by Fedex and very well packaged. 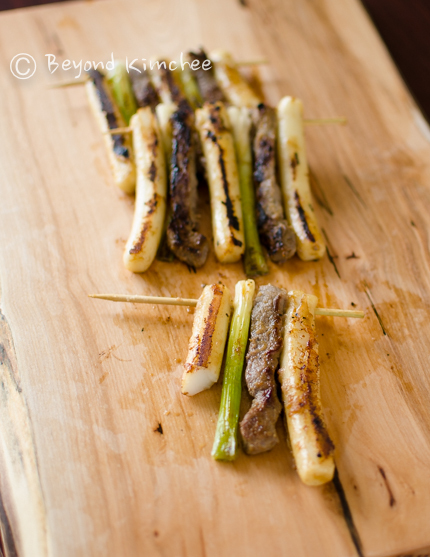 So, I used one of their beef cut to create today’s post; the Beef and Rice Cake Skewers. This type of dish is called “Sanjeok (산적)” in Korean. Sanjeok is traditionally made with beef and various vegetables skewered together, then covered with batter, and pan fried. 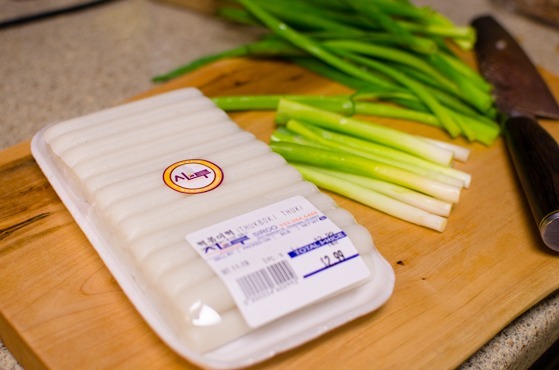 The spin-up for this traditional dish adds rice cakes. I am going to simplify the recipe by using 3 main ingredients and skipping the batter coating. 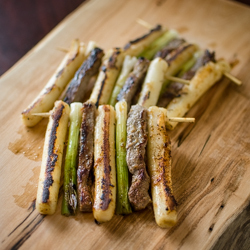 If you have a fine quality beef, fresh rice cakes, a bunch of green onion, and a little bit of Korean beef marinade…, you are good to go. 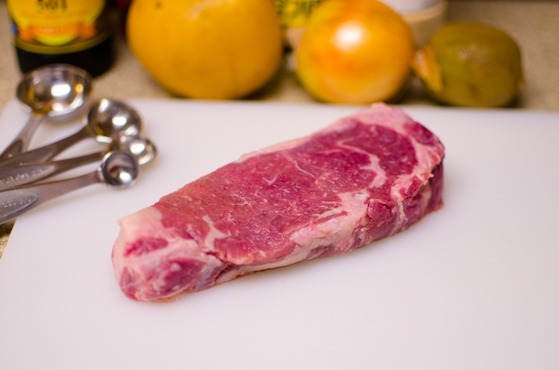 I chose this beautiful NY striploin for this recipe. The marbling almost looks like the grainfed beef. You can use rib eye or other tender cut of beef. Cut into 1/2″ strips and set aside. 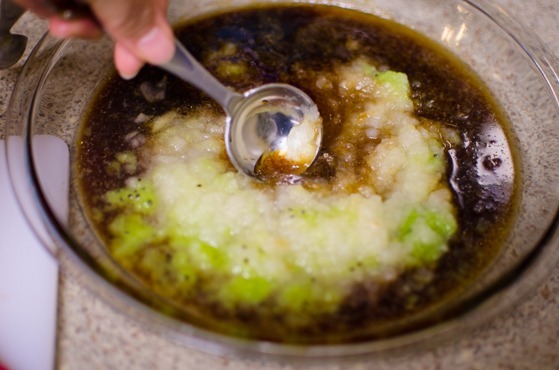 In a shallow bowl, combine soy sauces, sugar, garlic powder, sesame oil and black pepper. Grind in onion, tiny bit of kiwi (optional), and pear to the mixture. 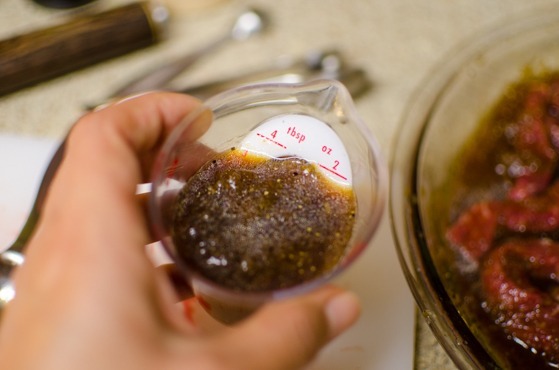 TIP: You can use store-bought Korean beef marinade for this recipe to make your life simpler. 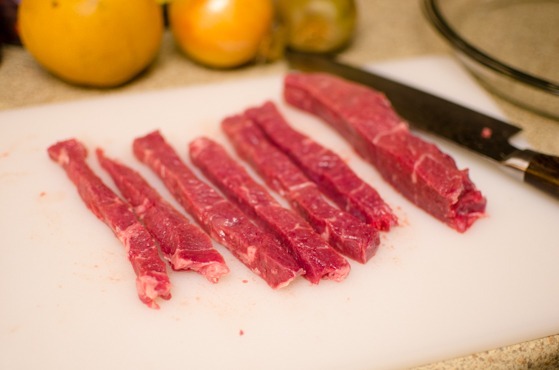 Add the beef strips to the bowl and toss together. Let it sit for 10-15 minutes to soak up the flavor. Fresh rice cakes works the best for this dish. However, if you have to use frozen kind, cook them in the boiling water until soft first, then proceed to the next step. Coat the rice cakes withe the reserved 1/4 cup of marinade. 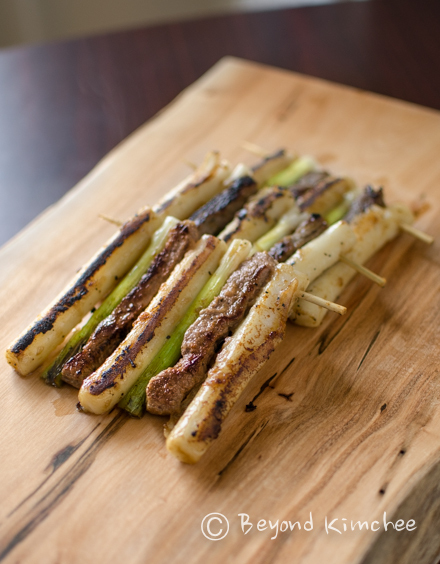 Skewer together one by one. 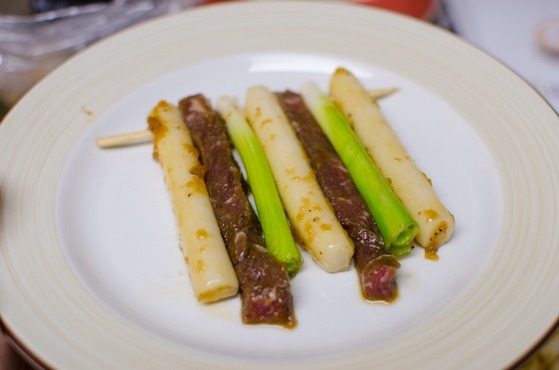 As you can see, I left the beef strips slightly longer than the rice cakes or green onion. The reason is…, the meat will shrink once cooked. 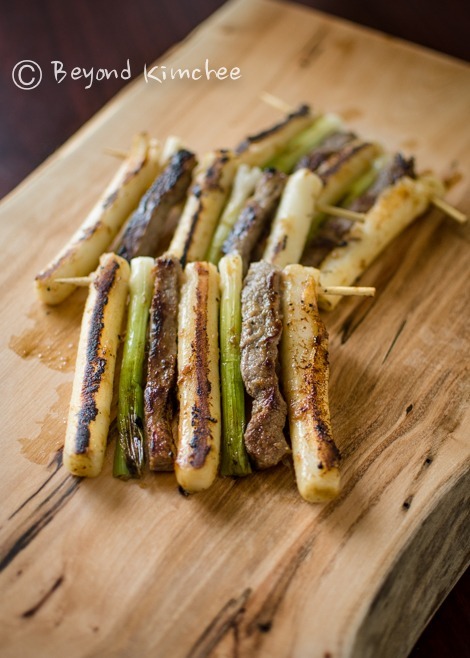 I would cut the beef about 3/4″ longer than the rice cakes. Note: I had to cut the bamboo skewers in half to get the right length. 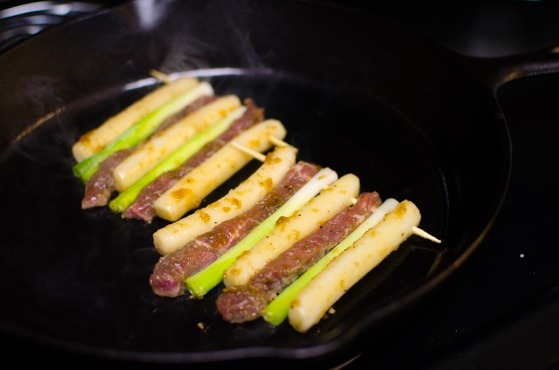 Heat oil in the skillet until hot, add the skewers and brown them about 1-2 minutes on each side. You can add a little more oil by using brush if the pan seems too dry. They cook fast. Such a simple dish to satisfy. My husband and the kids were raving about the beef after taking just one bite. The meat is costly but you are getting the finest quality beef available and it is better for you. They deliver their products to the members by creating a monthly subscription box. They also launched a kickstarter campaign to raise a fund for the company to meet the demand of producing more so they would be able to provide the finest quality products at a lower cost. Disclosure: This post was sponsored by The Bos Life. 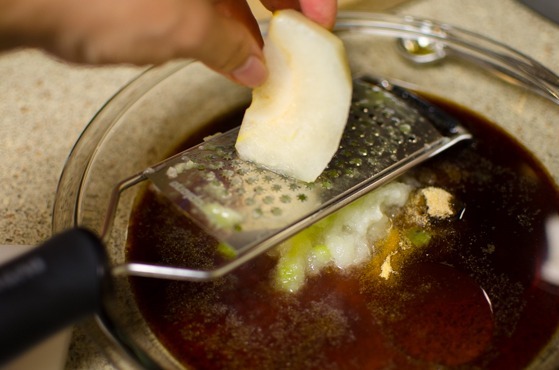 Make a marinade by combining soy sauces, sugar, sesmae oil, garlic powder, black pepper, grated onion, grated pear. and grated kiwi (if using) in a shallow bowl. Reserve 1/4 cup of the sauce in a another container and set that aside. 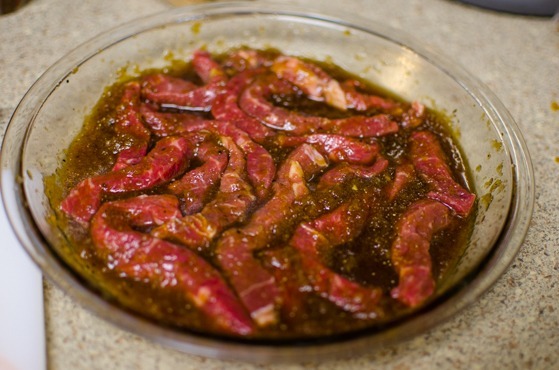 Place the beef in the marinade mixture and toss together and let it sit for 10-15 minutes to soak up the flavor. Toss the rice cake with the reserved 1/4 cup of marinade in another bowl. Heat skillet over med-high heat and drizzle a little oil. 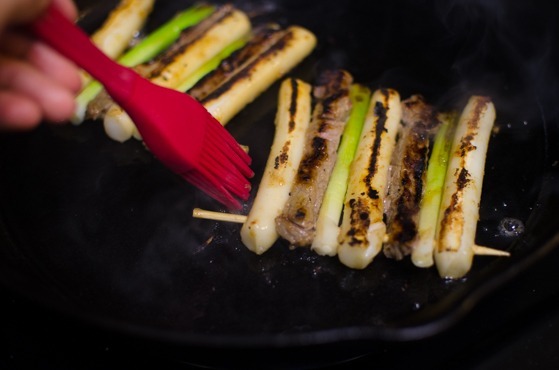 Place skewers on the hot skillet and brown them about 1-2 minutes on each side. Add a little more oil if the pan seems too dry. Serve warm or at a room temperature. This looks delicious!!! Glad your back! Hi Kate, it is good to hear from you. Hope you enjoy the recipe. So good to see you post again! I was actually wondering about how things were going with you last week - glad to see that you're on the way to getting back to 100%. And you provided us with such a great recipe in your first post back! This looks wonderful - thanks so much. Great to have you back! A couple of venezuelan fans living in Valencia, Spain have missed you dearly. Thank you Max. It is good to be back. Welcome back, Holly! I'm so jealous that you got to try the bos life's meat. (They contacted me too but I couldn't accept their meat as I live so far from the US. So I did a giveaway event instead for my readers. :) ) It sounds so good and delicious. Your new watermark on your photo is very cute by the way. Hi Holly! I am happy you are back since I really missed reading your blog. Also, glad to know that you're doing well on the recovery. Please work hard and post as many as you can for us. Thanks Holly! Thanks Nguyen. I am happy to be back. Welcome back, we've missed you! Way to kick off your first post, post surgery & recovery(ing)! (all puns intended....). I was so happy to see this in my in-box, thanks for checking in and letting us know how your doing, and for the delicious recipe! Please continue to take care of yourself. Thanks Angelita for your sweet comment. I feel much better now than I was 3 months ago but still not completely recovered. Looking forward to share more recipes with you all. 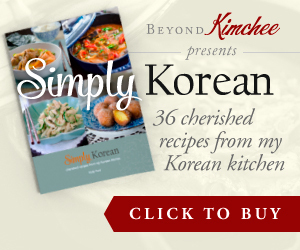 So great hear that you and your family enjoys making kimchi. Thank for the consistent support, Mike. Hi Holly, I am so glad you are back. Missed your photography so much. But remember, recovery is still your 1st priority. Hi Butterfingers I am happy to hear from many of you. Yes, I am doing everything it takes to recover faster and full. Thanks for your comment. So glad you're back! And i love rice cakes and this along with the sauce made me drool big time. LOVE IT! Thank you for all of your posts! 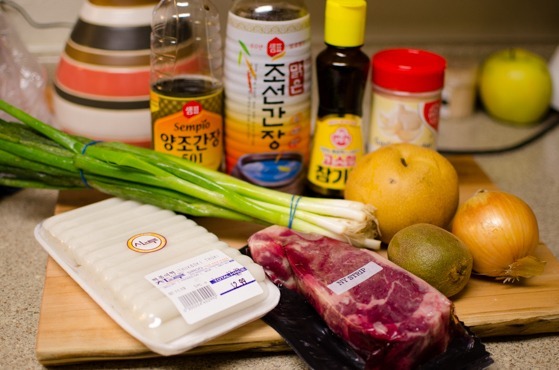 I am learning to cook Korean food for my husband, and I have to say I LOVE IT (maybe more than he does hehe). I look forward to all your recipes! Thanks Ali. I hope you get to try some of the recipes soon.